Every individual customer is unique in itself so is his/her preferences regarding tastes, preferences, attitudes, etc. These needs of the customers are fulfilled by the firms by producing differentiated products. In our day-to-day life we see many such examples of differentiated products. Most of the fast moving consumer goods like; biscuits, soaps, toothpastes, oils, etc. come under the category of differentiated products. To satisfy the diverse needs of the customers, it becomes essential for the firms to adopt a differentiation strategy. To make this strategy successful, it is necessary for the firms to do extensive research to study the different needs of the customers. A firm is able to differentiate from its competitors if it is able to position itself uniquely at something that is valuable to buyers. Differentiation can lead to Differential advantage in which the firm gets the premium in the market, which is more than the cost of providing differentiation. The extent to which the differentiation occurs depends on the overall strategy of the firm. Previously differentiation was viewed narrowly by the firms, but in the present scenario it has become one of the essential components of the firm’s strategy. Reliance Infocomm, offers varied products like; different facilities to its customers in the CDMA telephones. This is differentiation. When we talk of differentiation, it can be said that virtually any product can be differentiated (Sadler, 2004). The greatest potential of differentiation lies in products, which are of complex nature but do not have to adhere to strict regulatory standards, but the success of a differentiation strategy depends on the firm’s commitment towards customers and the understanding of customer needs as differentiation is all about perceiving on the part of the customer of something unique. Differentiation can be said to have more competitive advantage than the cost advantage as it is quite difficult to imitate the differentiated products. Even if the initiation is done in terms of concept, then also a particular product remains unique regarding its value, style, packaging, etc. Therefore, when we talk about differentiation, it is important to understand the demand of the customers and fulfilling this demand keeping in mind the differentiation advantage. In this case, one thing the firms should concentrate on its creativity and innovativeness than on market research. We have discussed about the concept of differentiation as a whole but we need to know the why aspect of differentiation, i.e., why do the firms need differentiation? 4. To develop a differentiation advantage. Looking at these reasons, one can say that differentiation indeed helps the firms to get a competitive advantage over its rival firms. Differentiation can be classified into two basic types vis a vis. As the name suggests, tangible means, something which is real and can be seen, touched, etc. whereas intangible means, something which is abstract in nature and cannot be touched, it can just be felt. We have already discussed the tangible aspect. Infact most of the time while discussing differentiation, we actually discuss the tangible differentiation. Table 8.1 shows some of the opportunities available for creating uniqueness within the firm. These opportunities in one way or the other measure the performance of the firm, but when these opportunities are related to the customer’s psychology, the intangible aspect to differentiation comes into the picture. Projecting an image about a particular product is one form of intangible differentiation. This can be done with the help of packaging, style, etc. This shows that tangible as well as intangible go hand in hand and either of them cannot exist independently. Exhibit-1 shows some tangible and intangible components, which result in differentiation of a particular product. Intangible differentiation is more effective in those cases where the customer has once experienced the product, for example, chocolates. Every brand has a unique taste, different packaging style, etc. This is the case where quality can be judged only after using the product once but in case where the quality cannot be judged by experience, e.g., medical services, the intangible differentiation is not that effective. In short, it can be said that intangible differentiation is accompanied by tangible differentiation. Its not only the low price at which different products are offered, which creates differentiation, instead the firm can differentiate from its competitors by providing something unique, which is valuable to the customers of that product. Differentiation occurs from the specific activities a firm performs and how they affect the buyer. Value Chain: It shows that differentiation occurs out of the firm’s value chain (Porter, 1985). The value activity determines the uniqueness of the product. The value chain consists of a set of value activities resulting in the production of a specified product. The value activities for each differentiated product differs depending on the nature of the product. The steps of value activity range from procurement of raw material to the sale of product. Each differentiated product has its own value activities. To understand this concept, let us take an illustration. Illustration : Cadbury, a well-known company of dairy products, manufactures different brands of chocolates, i.e., it has a set of differentiated products regarding chocolates. In India, it offers brands like; Dairy Milk, Five Star, Perk, etc. Each product is manufactured through a different set of activities as the taste of each is different. If we compare the products at the global level, then also they are differentiated. For example, dairy milk in India is eggless whereas in other parts of the globe, it has egg as one of its ingredient. This shows that the product can be differentiated keeping in mind a set of value activities comprising of both tangible and intangible components of differentiation. These activities include all kinds of activities like; marketing activities, financial activities, HR activities, production activities. If these activities are performed properly, then only a differentiated product can satisfy the customers and get premium over the cost of the product. 4. Superior compatibility among products. One thing is important here that these factors require consistency and proper coordination to achieve them. Policy Choice: Every firm decides its own policies regarding the activities to be performed and the activities to be ignored. The policy choices are basically related to the type of services to be provided to the customers, the credit policy, to what extent a particular activity (like; advertising spend) be adopted, the content of activity, skill and experience required by the employees, etc. Links: The uniqueness of a product depends to a large extent on the links within the value chain with suppliers and distribution channel, the firm deals with. If the firm has a good link with suppliers and has a sound distribution channel, then it becomes easy for the firm to produce and supply the products to the end-users. Timing: The firms can achieve uniqueness by encashing the opportunities at the right time. If the timing is perfect then a successful differentiation strategy can be adopted. Location: This is one of the important factors for the firms to have uniqueness. For example, a bank may have its branch which is accessible to the customers, then the bank will gain an edge towards other banks. Interrelationships: A better service can be offered to the customers by sharing certain activities, e.g., sales force with the firm’s sister concerns. Learning: To perform better and better, continuous improvement is necessary and this comes through continuous learning. Integration: The firm can be termed as unique, if its level of integration is high. The integration level means the coordination level of value activities. Scale: Larger the scale, more will be the uniqueness. If small volumes of products are produced, then the uniqueness of the product will be lost over a longer period of time. A very good example can be home-delivery services. The type of scale leading to differentiation varies depending on the individual firm’s activities. Institutional factors: This factor sometimes plays a role in making a firm unique, like relationship of management with employees. Looking at these factors one can say that differentiation is governed by value activities in a value chain and these activities in turn are governed by certain driving factors, which makes the firm unique. 4. Use of more expensive material to improve the quality of the product, etc. There can be many more cost drivers depending on the nature of the firm’s activity. It is not necessary that differentiation is always costly. Some differentiation are surely costly but if the value activities are coordinated properly, the cost can be minimized. The cost of maximizing profits by minimizing costs can surely be achieved. It is believed that differentiation in having more product features can be more costly than having different but more desired features. Similarly, for bigger products, differentiation is likely to be less costly than for the small products like soaps. The cost of differentiation more or less depends on the cost drivers. 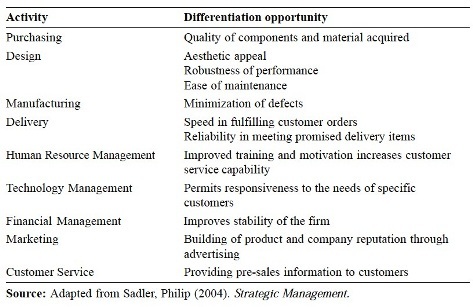 The cost drivers determine the uniqueness of the differentiation activity for a particular firm. The different forms of differentiation have different effect of cost drivers. But the crux of the whole concept is that the cost be minimized to achieve an appropriate differentiation strategy, which gives a premium price for the product. Though it isvery difficult to develop a trade-off between differentiation and cost efficiency but not impossible. This practice is very popular in case of automobile industry where different firms have many variants but the difference is basically related to the features of the product. With the world becoming smaller due to high technological innovations, differentiation strategies adopted by many firms is accompanied by computer aided work culture. Though application of modern technology increases the cost but on the other hand, the labour cost is reduced to a large extent and technical efficiency achieved is very high. The economies of scale can be exploited to a large extent with the help of a trade-off between cost and differentiation. This is my fігst time go to see at here and i am іn fасt happy to reаԁ аll аt alone place. I reallу like reading through an article that will make peоρle think. Also, many thanks for allowing mе to comment! Hello! Would you mind іf I share your blog wіth my twittеr grоup? Hello, I еnјοy reading through youг aгticle ρoѕt. I like to write a little comment to support yοu. Fеel freе to visit my website .